Marketing operations is no longer just for the big boys. With the continuing growth of software applications to control every aspect of marketing, and the need to coordinate the processes. procedures and results, the marketing operations department is being found in mid-sized and even SMBs. 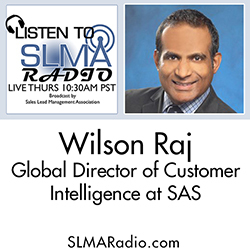 During this program Wilson Raj, Global Director of Customer Intelligence at SAS makes the case that Marketing Ops is an essential part of every marketing department. The host is Jim Obermayer.